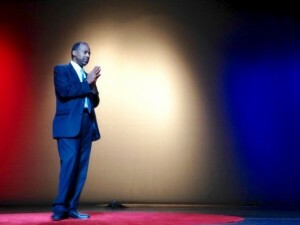 Before a packed audience at the Detroit Music Hall, Detroit native Ben Carson officially kicked off his presidential campaign Monday morning. “I’m Ben Carson and I’m a candidate for president of the United States,” he said. He may not have the pedigree or the political experience for the race, Carson said. Carson told a Florida TV station Sunday night that was joining the race. And from Detroit, he had been scheduled to travel to Iowa, for three days of events in the pivotal state where the first presidential caucus of the 2016 election cycle will be held Feb. 1. But, he switched up his plans early Monday and said he’ll go to Dallas to be with his critically ill mother Sonya Carson. At the Charles Wright Museum of African American History before he announced his bid, Carson told reporters that he’s anxious to hear what other GOP candidates have to say. “If they’re all saying the same thing I am, fantastic. The more the merrier, bring ’em on,” he said. “Let’s talk about what our ideals are. The only thing I’m going to be doing is to encouraging people to think for themselves. Listen and think for yourself. Don’t listen to pundits and the people who try to control everything. His choice of Detroit for the official announcement is no surprise. He grew up in the city, the son of a house cleaner and a father who left the family when Carson was 8. His mother, Sonya, had only a third-grade education, but didn’t let on to her sons. In speeches around the country, as well as in his autobiography “Gifted Hands,” the Republican who now lives in Florida often tells of his mother demanding that her two sons turn off the TV, read two books each week from the Detroit Public Library and write a report on those books that she would mark up — even though she couldn’t read the words. “I knew of him from his surgeries and then I heard him at the prayer breakfast,” said James Boucher of Bloomfield Hills, who came to the museum to hear Carson speak. “I’ve admired him for his whole career, and that he’s coming out of Detroit. I think he’s an inspiration for all the parents and all the children in Detroit. “I like his view on what we need to do to get the country back. He’s a believer in capitalism and the American dream, Boucher added. His wife Jeanne Boucher likes the fact that a Michigan son may get to the White House, “We missed that opportunity last time,” she said.